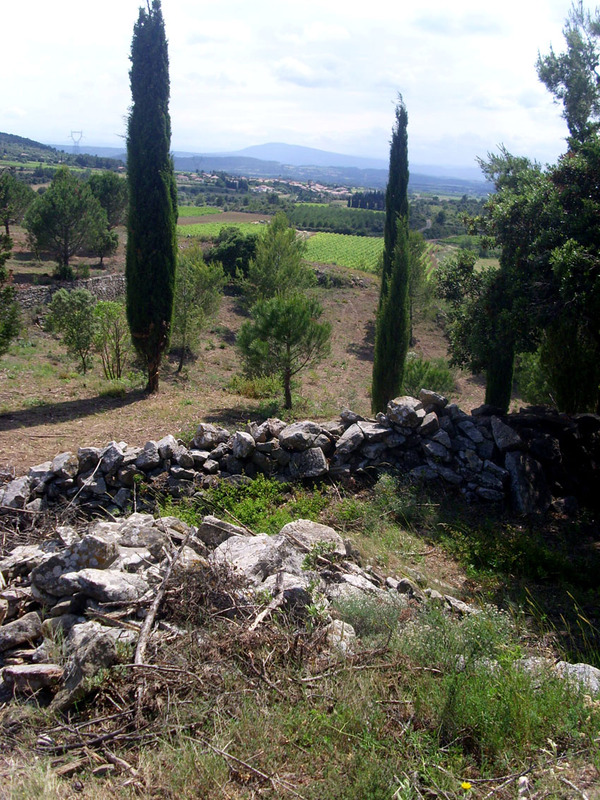 I found the location is not far from Olonzac in the Minervois, on the top road between Béziers and Carcassonne. 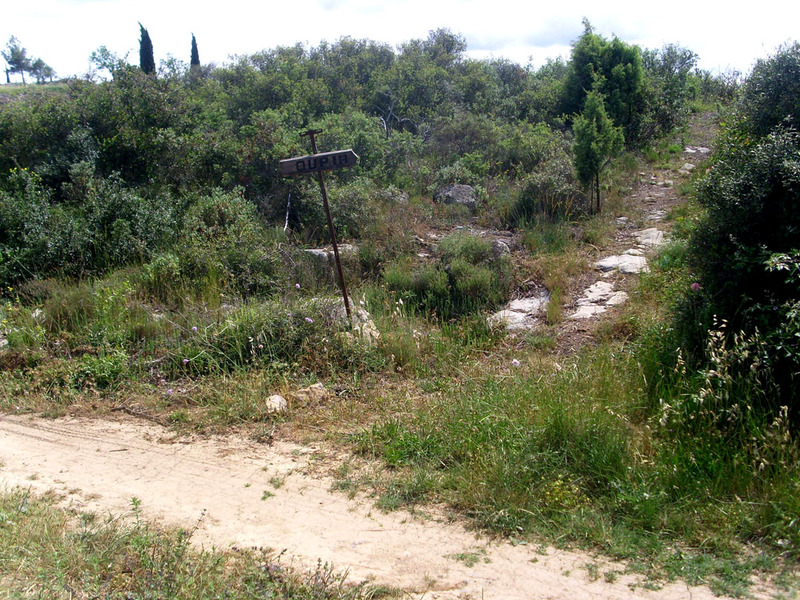 The cutting said; The cleaning operation organised by the municipality has brought back to life a village of which the remains were engulfed by vegetation. Saint-Côme is on a small wooded hill. 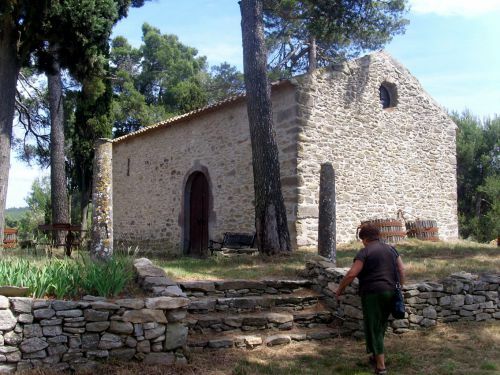 In 1973, an archeologist René Feuillebois undertook excavations and found a chapel, 15m by 6m, on the summit of the hill. It was Visigothic. There was much interest in this, but by 1980 the site had become overgrown. 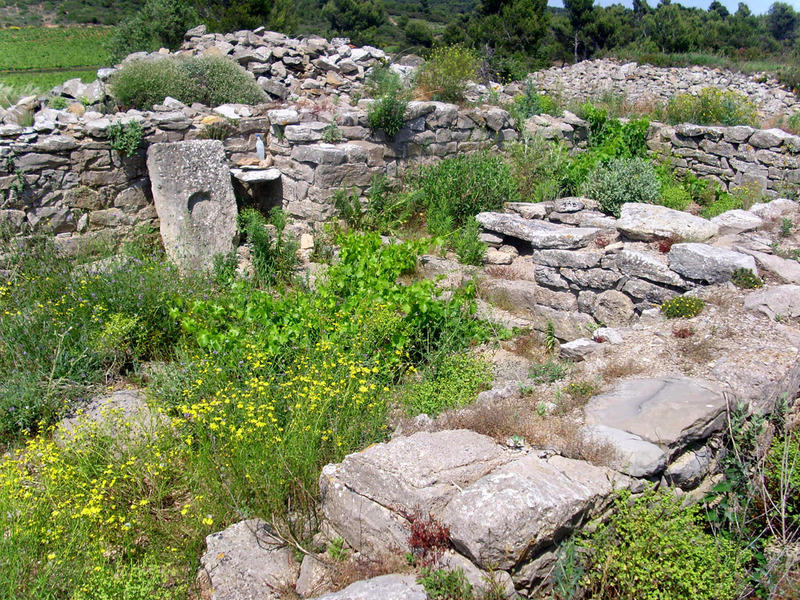 The newspaper speculated that the Visigoths established a cult on the site of an older cult. However, the Visigoths were Arian Christians after the 3rd century priest Arius of Alexandria - the only older cult would have been Celtic, because Roman Catholicism only arrived in our region around the same time as the Visigoths. It's possible the site was a Celtic Nementon, or meeting and festival place. The May work of "nettoyage" revealed "enormous piles of stones, which were not scattered about by chance. 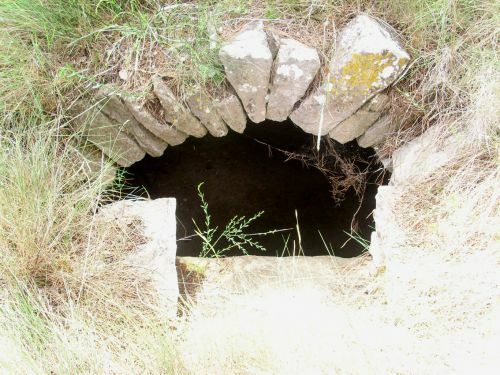 The workers for the mairie, and the Pompiers of the Forest cleared these walls; walls of cut stones, load-bearing walls, enclosures with doors and staircases shelters, wells (well-hidden) . 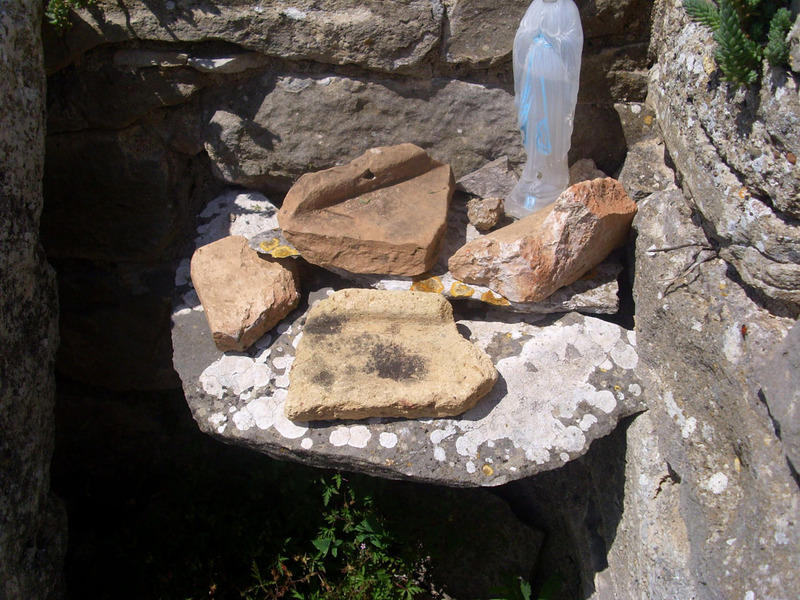 . . some stones were strange, seemingly re-used several times during the centuries." To celebrate, the municipality organised a great picnic for Whit Sunday. Many of the villagers of Beaufort came. 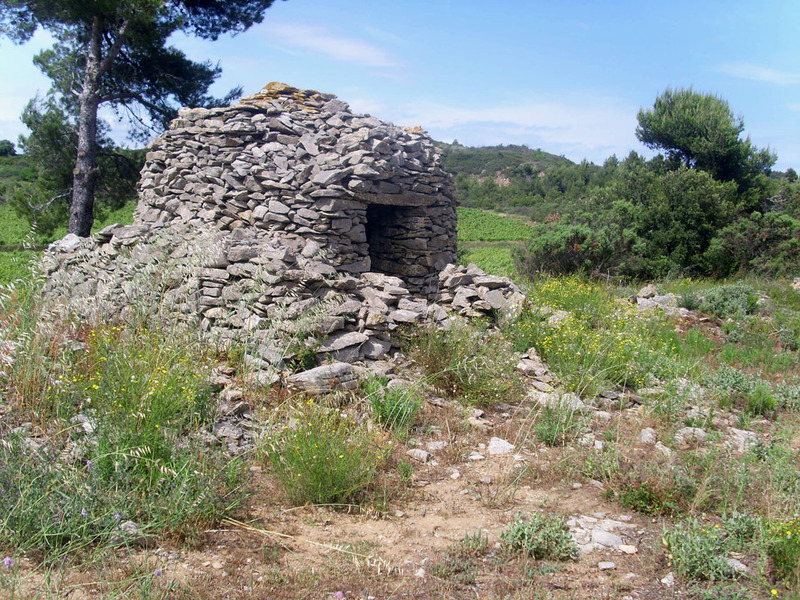 Meanwhile, the site is at a "crossroads of hikers' paths" and will be on the route of the future "Interaire botanique" of the Minervois. I was curious; who was St. Côme? He and his twin brother Damien were doctors/surgeons, who came from Arabia and practised in Syria, refusing to take any money for their services. They were martyred (horribly) by Diocletian in 303AD, but churches were later built to them by Justinian in Constantinople during the 6th century - the time of the Visigoths - and they became popular. Presumably then, the little church at today's St. Côme near Beaufort was dedicated to them? That dates it as between 414 and 568 approximately. We found it! 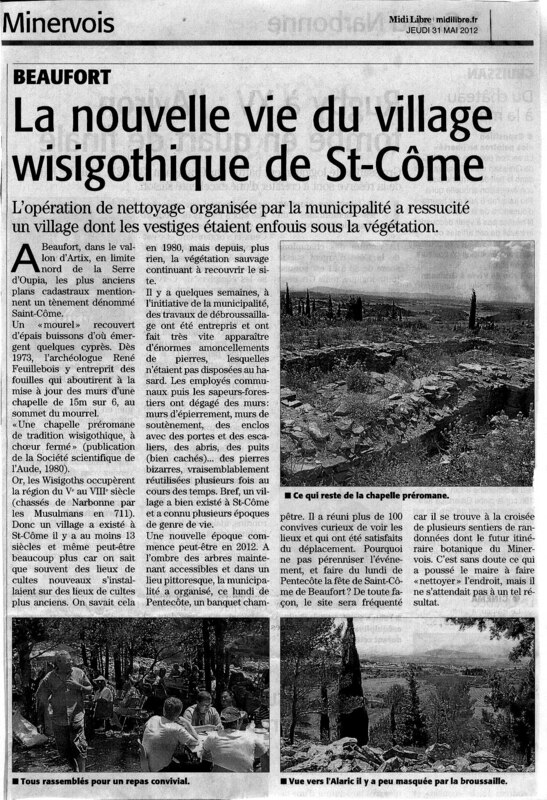 The village is St. Côme is exactly where it is marked on the map above. You take the D168 out of Beaufort, sign-posted Artix. At the junction with the second minor road to the left, you find a parking space. 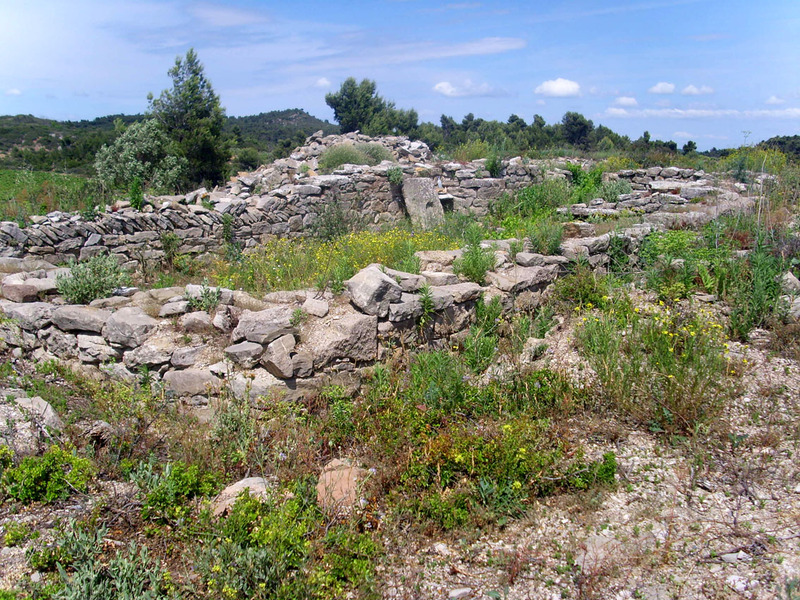 Opposite that junction, The Visigothic village is visible to the right from the road. 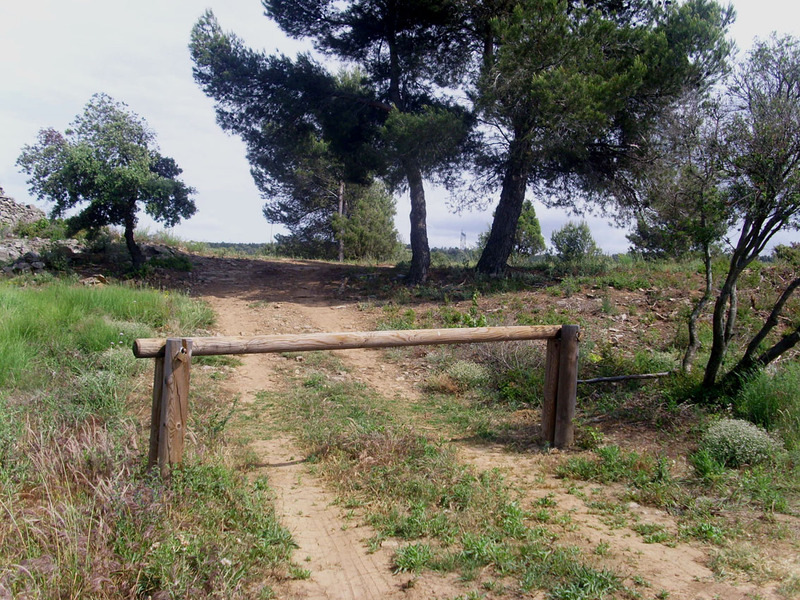 A Roman/Visigothic road still exists on the right before you reach the gate. 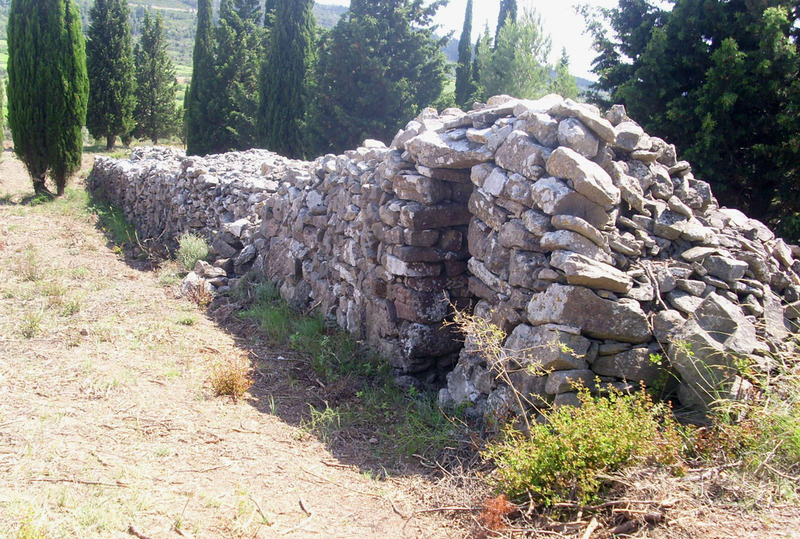 We didn't find any walls or wells, for most of the stones had been re-used to build "capitelles" or shepherd's huts. The church was clearly Visigothic, as evidenced by the separation of the altar space from the main body. At the far end you can see the space was the altar was separated from the body of the church; there would have been two pillars with a horseshoe arch above them, as you can still see in the church of St. Martin-des-Puits in the Corbières and St. Laurent, near Moussan, just off the D607. Someone had collected broken tegulae and put them on a little shelf with a very kitsch Virgin! 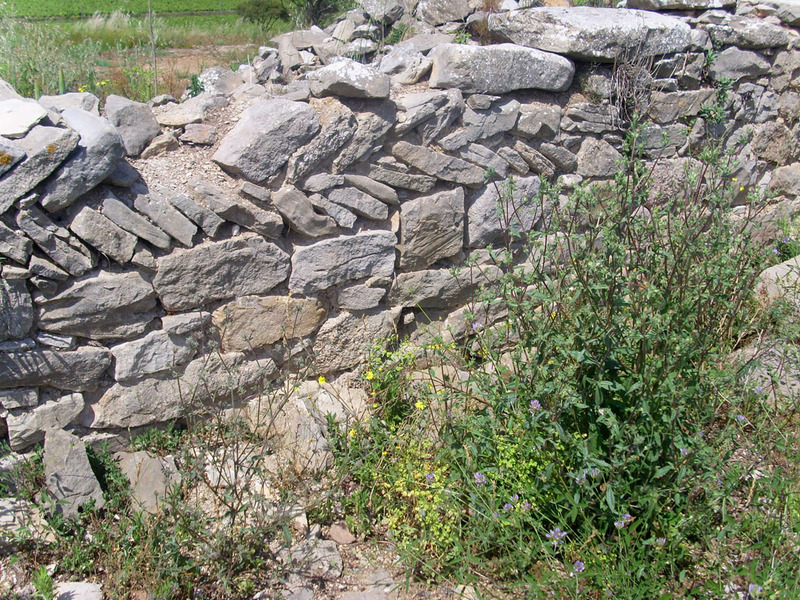 The detail of the stonework was typically Roman/Visigothic. 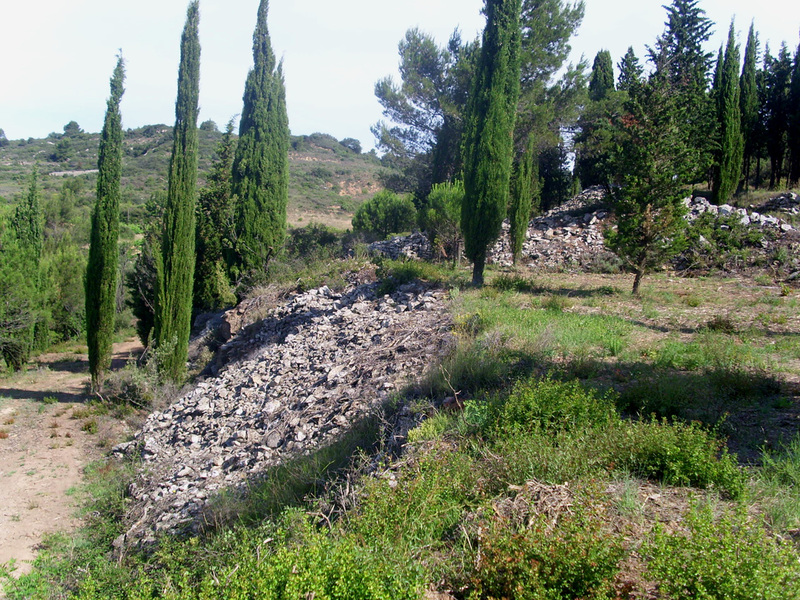 And we found the remains of ramparts, parts of which were circular and could have been a watchtower. 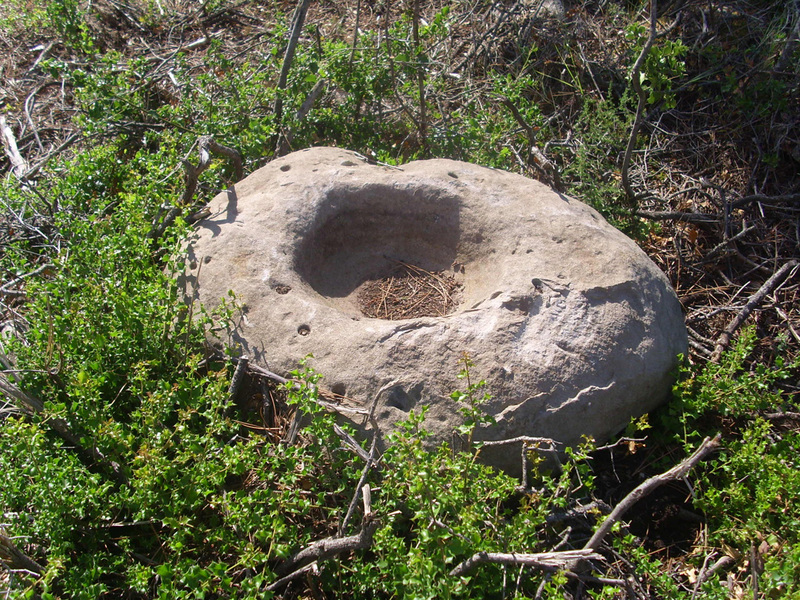 There was also a stone on which corn could have been ground into flour. 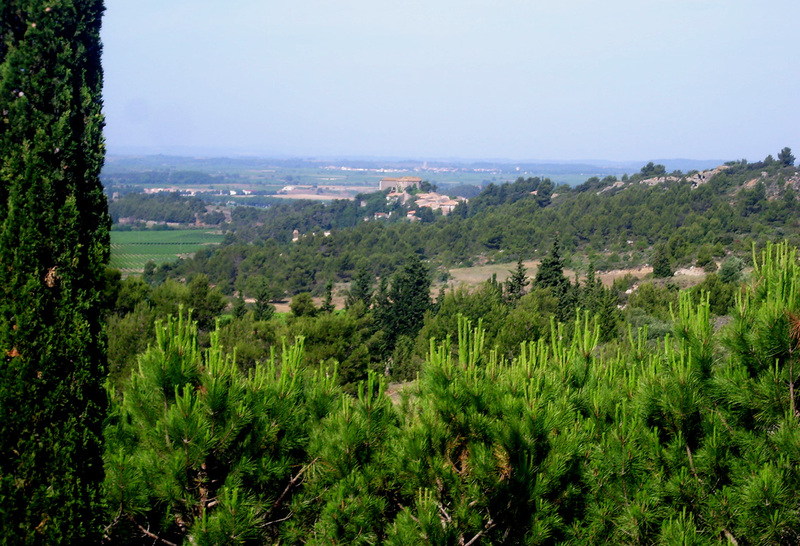 The view from the top of the hill was tremendous, with the village of Oupia, then the Montagne d'Alaric in the distance. There was a lovely view of Beaufort with its castle, which I believe was also of Visigothic origin. The day was very windy, but on the eastern lee of the hill more sheltered, and this is where the small houses and lanes of the village were situated. I made a short video of our visit to this lovely site; it's very amateur but does capture the atmosphere . . . click here to see it. I have long held the 700 metres theory. 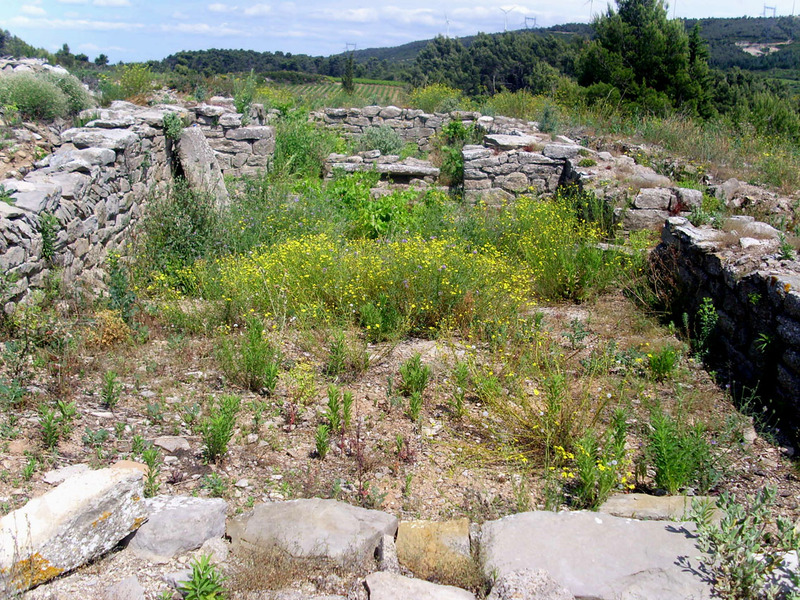 The Visigoths built their graveyards some 700 metres from their centre of habitation. 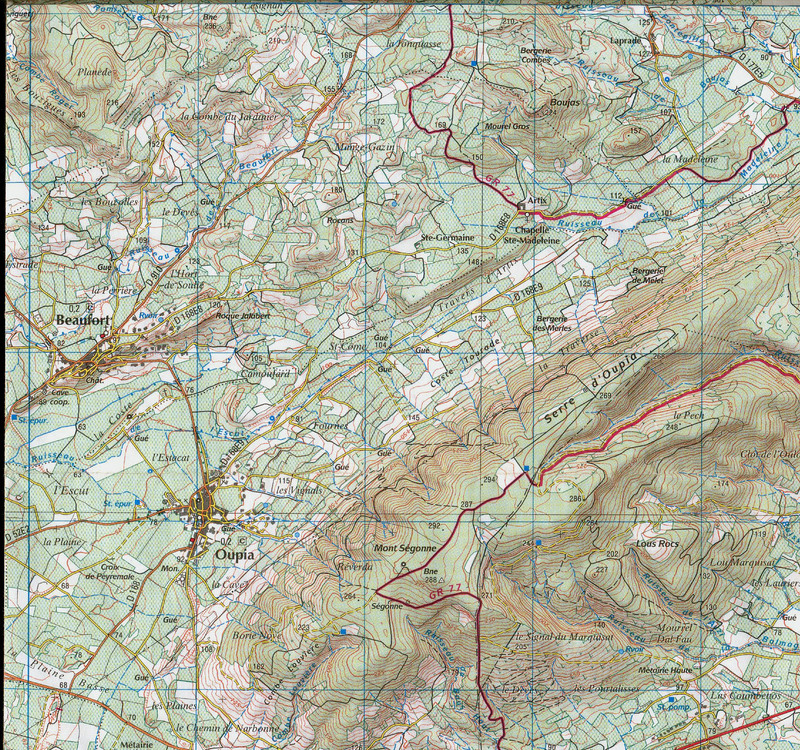 (On the map above each blue square is one square kilometre. Work it out for yourself!) I have seen this is various places, such as La Palme and Canet d'Aude. There was NOT therefore, a cemetary, near the church/chapel at St. Côme, but it was futher east. And I think the chapel on the graveyard was built at the same time as St Côme, for look at the brickwork above, and the brickwork in the back wall of Ste. Madeleine. Beside the chapel were tables and chairs, and pipes had recently been laid into the back of the chapel, so it is obviously still in use. 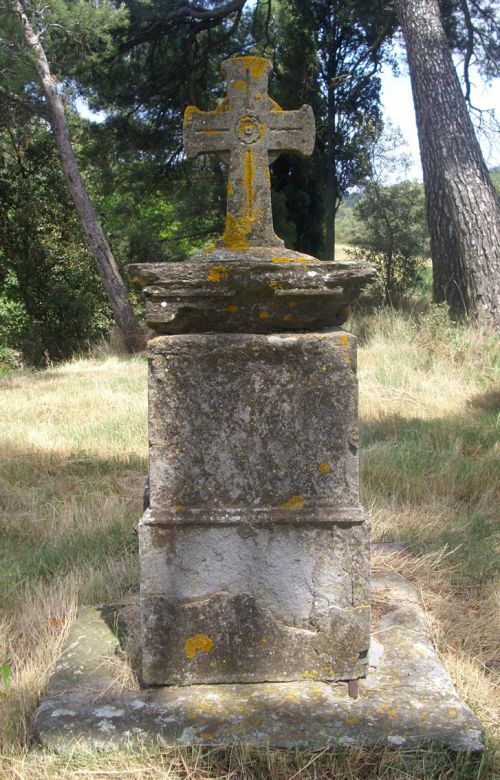 The cross is quite recent, maybe even 19th century, with a rose in the centre of it. You notice the door is on the side of the chapel, which would be recent, as churches generally faced east and therefore had the door on the western end. But this seemed the other way around - anyway, I looked at the far end of the chapel and made a discovery. At first I thought it was a well. But no, I'd found a crypt. There was a house opposite and so I knocked on the door to see if they had a key to show us round the chapel, but no one was in . . .
Later the Mairie of Beaufort gave me information about viewing the chapel. 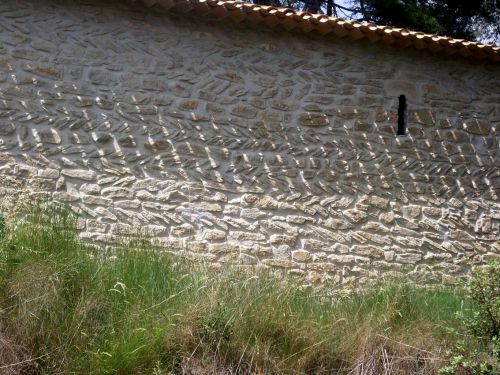 They told me that the house opposite was a wine chateau, called Chateau Artix and so I rang the number given, and the following weekend, we went to see the Visigothic village for a second time, and then continued to Ste. Madeleine d'Artix. We were able to see inside the chapel. 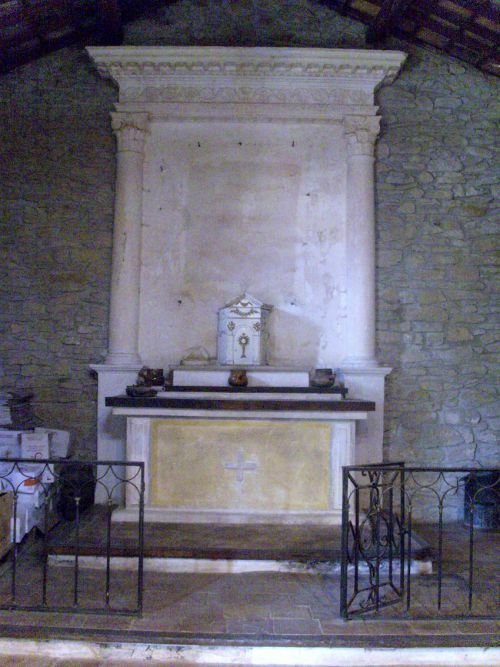 The altar was typically 19th century - the chapel had remained in use as a religious building until then. 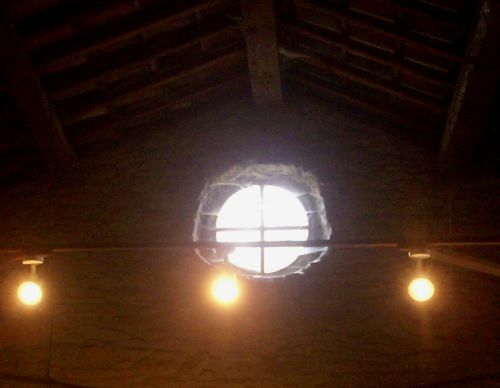 Exactly opposite the altar was a small round window (see the first picture of the chapel above) and through this window, every summer solstice (we were just 3 days too late!) the sun shines straight in and straight onto the altar. On the altar used to be a large painting of Mary Magdalene; it was stolen not long after the present owner came to live here 15 years ago. It is rare for religious buildings to be orientated north-to-south rather than east to west. This explains the door in the side and it hints at pagan origins . . . 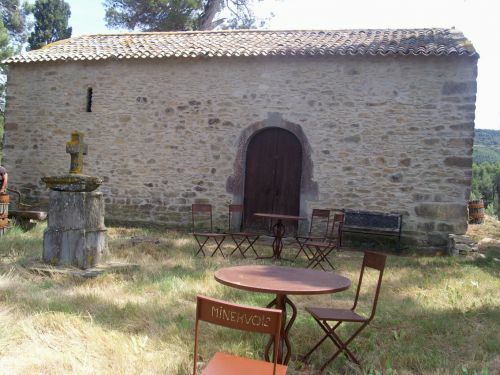 The owner told us that his house opposite the chapel started life as a Roman villa that gradually was re-used, and renovated throughout the centuries; discovered at his house were the two Roman pillars that now mark the entrance to the chapel. (See the last picture of this article.) 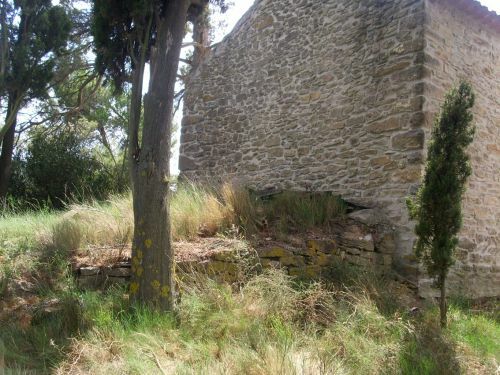 He thought the chapel was used by the inhabitants of his house in olden days and found it interesting that it was once the chapel of a Visigothic cemetary. 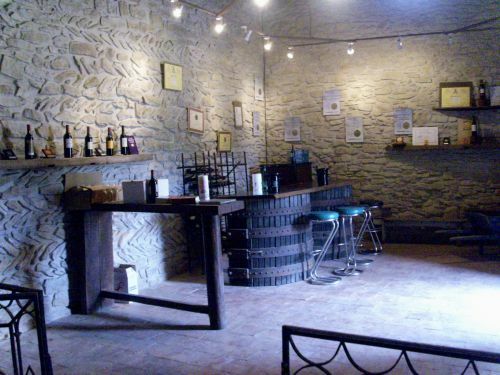 Now the chapel is a wine-tasting room. But we loved it! There was no sense of desecration, it was full of atmosphere. Jokes were made about turning water into wine ("You ignoramuses - that was Jesus, not Mary M!") 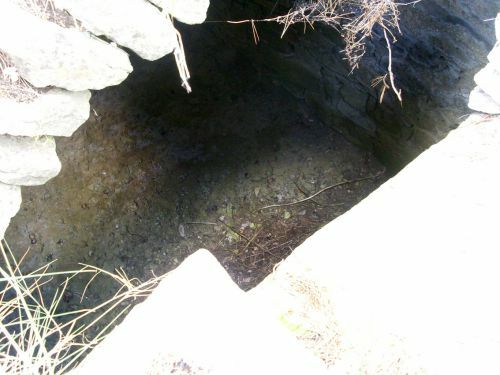 and the owner confirmed, for some of our group thought the opening at the end of the chapel was a well or cisterne, that it was in fact a crypt. "We have found many bones here, and a skull," he said. Basically, he is not a historian but a winegrower. Within three years his wine was winning medals, not only in France, but in Brussels and the USA. We had our tasting. The wine is made from a mixture of grapes, 50% Syrah, 30% Grenache, 20% Vieux Carignan, all grown and picked by hand, on his land which has been known for centuries. 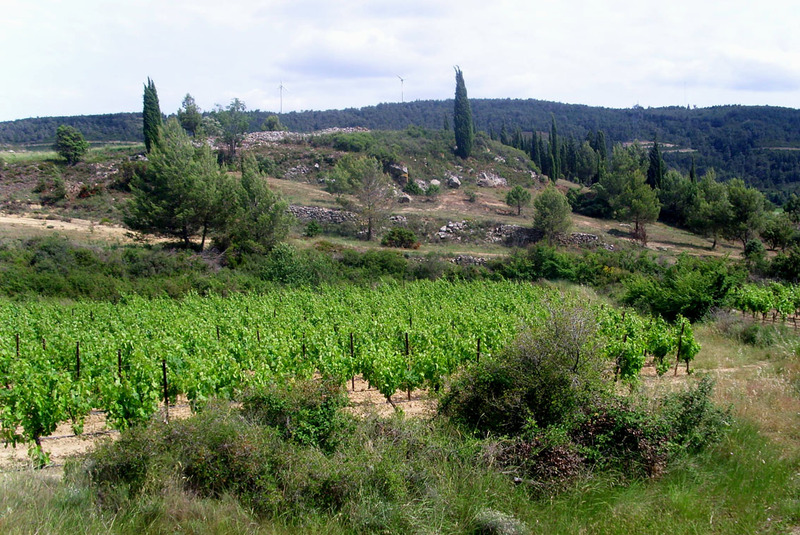 In Cathar days, Artix was a tenanted farm belonging to the castle of Beaufort; today's farm, with its 80 hectares, unbroken, of vines, has existed since 1407. The land is known for its unique geology and flora, such as wild asparagus and the incredible scented broom which is very sensuous. The wine "tastes silky but hold on a bit for a beautiful fruity experience of ripe, melted berry aromas", it says in a wine guide! The price per bottle was low for such a quality Minervois, which costs twice that in the shops. AND there's a discount of you buy a whole box of six bottles. This is serious stuff! 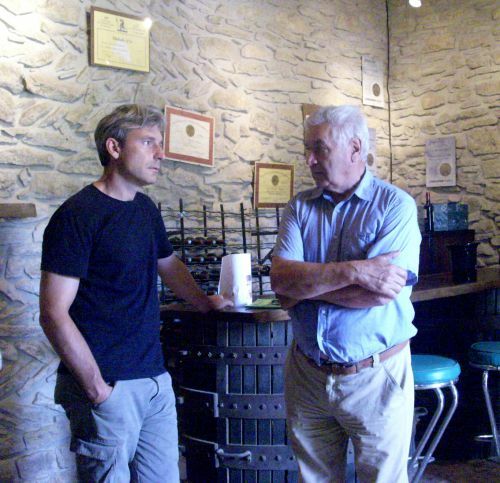 The owner is Jerome Portel, (on the left) and he is happy to accept groups for tastings, however large or small. You can make a booking by telephone 04 68 91 28 28. 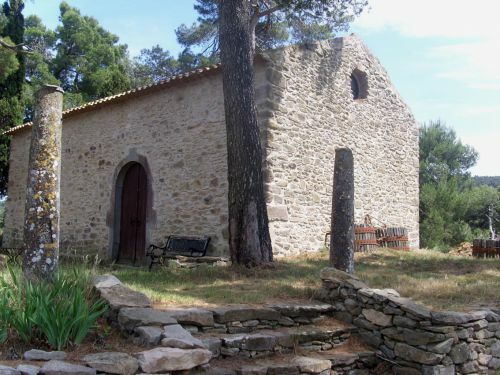 It's my idea to go with friends for a picnic and sit beside the lovely chapel in its unique peaceful surroundings and buy some wine from Jerome and drink it in the countryside in which it was made. And I think Mary Magdalene would have liked that too.